Whether your business focuses on shipping, manufacturing, or distributing goods you’ll need reliable, accurate, and dependable industrial weighing scales. Industrial weighing scales are the backbone of many industries and are commonly used in warehouse shipping and receiving, dry chemical operations, fertilizer plants, and other heavily industrialized settings. As well, these scales can be used for Gaylord, drum, container, and pallet and skid weighing needs! Floor Scales Direct is your source for all things related to industrial weighing scale. Our comprehensive selection of industrial weighing scales also includes useful accessories and options that can enhance the functionality of an industrial weighting scale. From our easy access ramps to scale side guards, we guarantee that we have the scale parts that you need to make your new scale an instrumental part of your daily business operations. Floor Scale Direct’s industrial scales all come rated for outdoor use, feature highly rugged design, and withstand the most demanding industrial settings. The scale’s more sensitive parts are housed in a strong stainless steel enclosure that has been designed to tirelessly operate in a trouble free manner. These types of scales are incredibly easy to setup and come calibrated and fully stocked with all of the wires you need to operate the scale. One popular model of industrial scale is the industrial platform scale. These types of scales are used for numerous industrial applications that range from basic warehouse shipping to aircraft container weighing. Our industrial platform scales have weight capacities that range from 20,000 pounds all the way to 60,000 pounds. These scales are just as rugged and durable as other industrial scales but are especially suited for heavy duty industrial weighing needs. 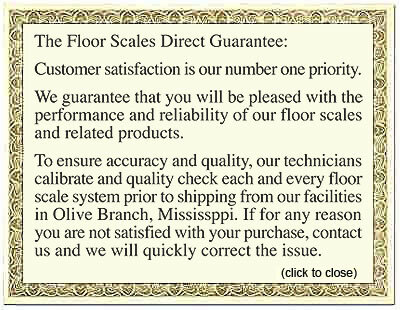 If you need a new scale, feel free to visit www.floorscalesdirect.com to view our selection of platform and other types of industrial scales.